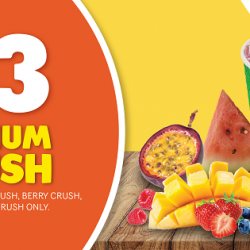 28 May - 13 Jun 2018 Boast Juice Bars: All Medium Size Crushes at $3 for A Limited Time Only! Thirty Boost Juice Bars and counting! Thanks to all Boost Lovers' support, Boost is offering all Medium Size Crushes at $3 only! Terms & Conditions apply. Valid from 28 May - 13 June 2018.